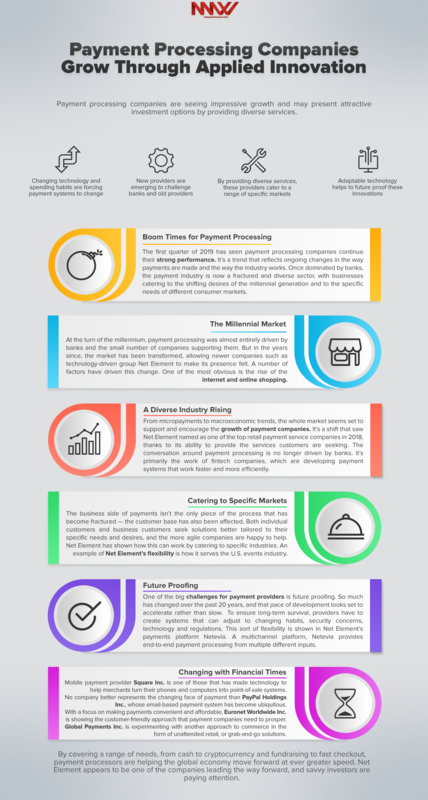 Payment processing companies are seeing impressive growth and may present attractive investment options by providing diverse services. Net Element (NASDAQ: NETE) (NETE Profile) is capitalizing on this growing space by providing an integrated payment solution that includes online, mobile and smart point-of-sale payments solutions for merchants in diverse industries. Square Inc. (NYSE: SQ) is working with trends such as bitcoin and in-app payment. PayPal Holdings Inc. (NASDAQ: PYPL), the big name in the sector, processes over $155 billion a year in mobile payments. The process is still connected to the cash economy through systems such as the ATMs of Euronet Worldwide Inc. (NASDAQ: EEFT). Services being developed include shopping without a checkout and online fundraising, areas Global Payments Inc. (NYSE: GPN) is working on.